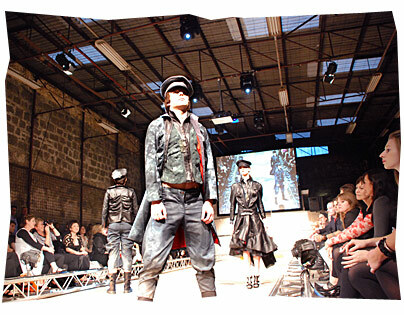 I was at the recent Curtin University Fashion and Textiles graduate show. I have been to a couple in past years, but this one was quite unlike anything I have seen before! 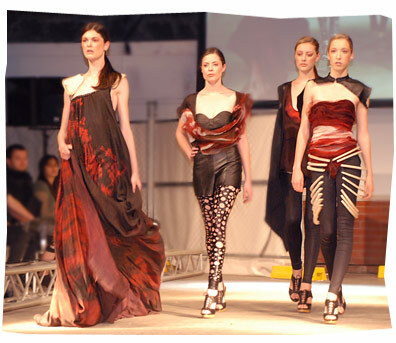 True to fashion’s role as “theatre”, rather than just a parade of clothes, the whole event was part catwalk show, and part exhibition/performance art. Guests wandered through a series of little contemporary-art style performance scenes, which of course were all showcasing the various student’s garments. One or two had live models as the mannequins – which gave them quite a job, as they had to stand perfectly still all night! Adding to the atmosphere was the venue, the grim confines of Fremantle prison, built in Victorian times, but still operating as recently as the 1990s. It’s now a cultural heritage museum. The catwalk show itself was as good as anything I have seen recently, and there was plenty of stuff that went from eye catching to immediately wearable. The Curtin Fashion and Textiles has a reputation amongst Perth designers as the course where students are given freedom to experiment with aesthetics and materials, and this was impressively demonstrated by this work by Ruby Mariani, where the train of this dress seems to be melting onto the floor. Totally un-wearable, of course, but a girl can dream!